I distinctly remember the salient points of a Thailand exposition and convention bureau briefing some two years ago where the strong suits of Asia, the Philippines included, was pointed out not to be in manufacturing as the most up-to-date technology is prohibitive but rather handcrafting. The brief made sense to me especially where the Philippines is concerned as we have a rich history of arts and crafts. Sadly though, these crafts seem to be relegated either to museums, overseas collectors, or worse, to the history books. I personally have abandoned my old practice of collecting stuff but I do keep a small stash of woven fabrics and stuff accumulated from my travels or given by friends -- Abel from Ilocos, T'nalak from Lake Sebu, colorful mats from the Badjao weavers of Tawi-Tawi, Yakan cloth from Zamboanga, an Ifugao design belt bag from Paracelis, among others. Looking through them is like reliving age-old traditions and harkening to an older age where people created things by hand, bartered these handcrafted treasures for important provisions, and even kept the most beautiful ones as heirloom pieces. 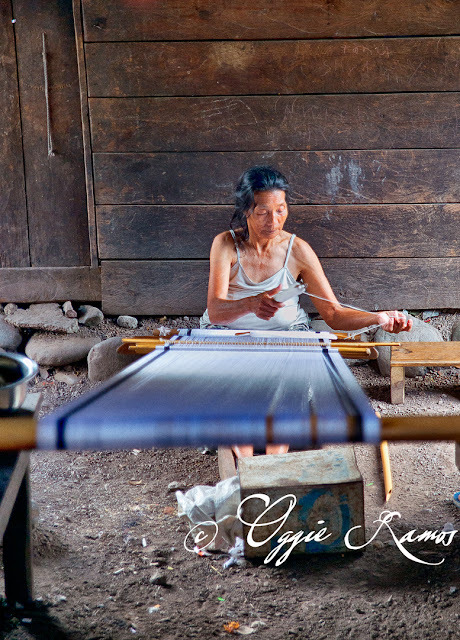 Having been a very frequent visitor the past three or so years to Bontoc, Mountain Province, I have been increasingly curious to the weaving traditions of the highland people apart from what is seen in the mainstream such as the products of Sagada Weaving and Narda's. I'm also more interested in seeing for myself the weavers in their natural environment instead of contenting myself with viewing their products in Baguio or an ethnic shop in Manila. During our most recent visit to Bontoc, we were privileged to be given an opportunity to go to Caneo to see the weavers, talk to them, learn their insights firsthand, and admire their handicraft up close before they find their way to stores elsewhere. It may seem that these woven crafts are merely decorative. However, to me, these are like road maps to a culture and tradition. As the late Dr. Caridad Fiar-od wrote in her article presented posthumously during the International Igorot Consultation in St. Louis, Missouri, in 2014, the woven crafts symbolize and signify a raft of things -- from the status of the wearer to protection from evil. From using kapok fibers to cotton thread, the times may have changed along with the materials used, but the essence of the hand-crafting tradition remains alive into the present millenia. 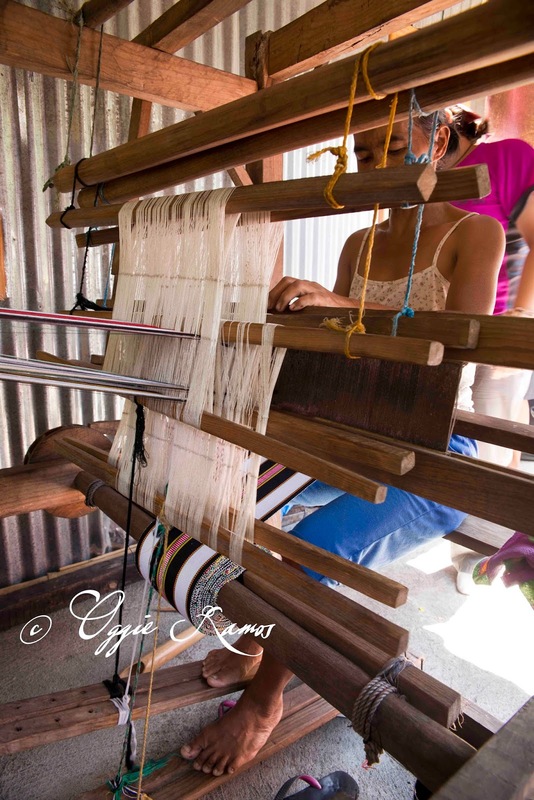 In the present as in the olden times, weaving literally brings the fabric of the community together where the women find a common passion in gathering threads and creating beautiful art that can be worn as well as adorn their homes. CANEO CALLING. Our friend, Suzette Bencio-Chees of Suzette's Maligcong Homestay would be our companion during our trek through the villages of Caneo. Her hubby, Jerome, was very generous in taking us to the jump-off to the main village, some eight kilometers of undulating road and scenic views from the Bontoc poblacion. The vehicles on the road were few and far between as public transportation is sparse -- just a jeepney plying once from Caneo to Bontoc proper in the morning, another going back in the afternoon. Little wonder that apart from just one foreign tourist, we meet no other outsiders during our afternoon here. We came to the main village by midday and found quite a lot of the houses deserted, their inhabitants out planting in the fields by the edge of the river. We lucked out in stumbling upon Nanay Catalina, leather strap behind her back weaving pantig (decorative colorful thin cloth that resembles a sash or belt used as border trim for the wider fabrics for tapis (wraparound skirt)) under her house. 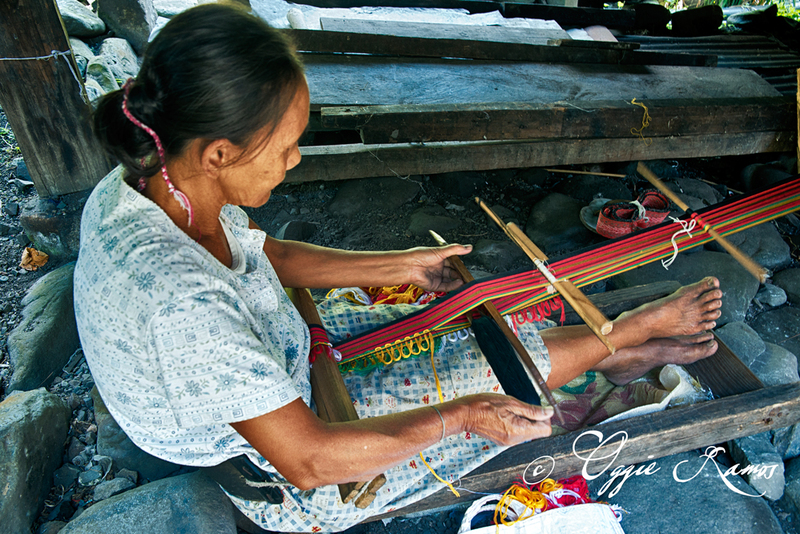 This is the old traditional way of weaving called Tinakud or backstrap weaving. We would ask questions and Suzette would translate for us. Nanay Catalina seems diffident at first but warmed up to our presence, perhaps sensing our genuine interest in her craft. She had just spent a good portion of the night in a wake in Maligcong and was trying her best to keep weaving even as her eyes kept blurring from lack of sleep. I observe that sitting almost semi-slouched to keep the threads taut must be hard on the back. She replies that it's easier to plant in the rice fields than to weave with a backstrap. Could be the reason why in our trek, we only saw just two more backstrap weavers. I left my belt at home so I was looking for something I can fashion into one. I ask Nanay Catalina if she has some ready made pantig as the one she's is making at the moment will be finished in three days' time. She went inside her house and found me a roll, a lovely piece of predominantly black and red with yellow and green accents. I immediately think of a hundred and one ways of putting this woven artwork into good use -- as accent for my Japanese leather sketchbook, as binder/holder for my Moleskine, accent for my Peak Design camera strap, the list can be endless. Across Nanay Catalina's house, we saw Auntie Benita busy on her loom as her granddaughter, Shakira, observes her skillful hands and feet in constant motion. According to the map markings I based my Bontoc Art Map on, Caneo is really focused on loom weaving, called Tilar, so it's a pleasant surprise to see both kinds being practiced here. Sitting upright, loom weaving is kinder to the back, says Auntie Benita. It's faster as well, a fact not lost on us as she speedily put the finishing touches on her 22 yard creation, a wide, white fabric with geometric accents for a wraparound skirt, while we hang around and observe on her balcony. 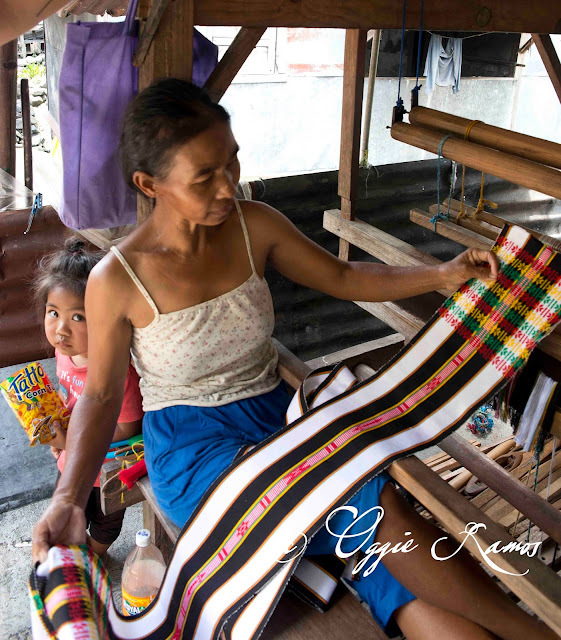 We ask where she gets her design ideas; she replies that at times she dreams about them, drawing parallels with the dream weavers of Lake Sebu in Cotabato. We found out from Auntie Benita that the weaving tradition here predates the one in Sagada. 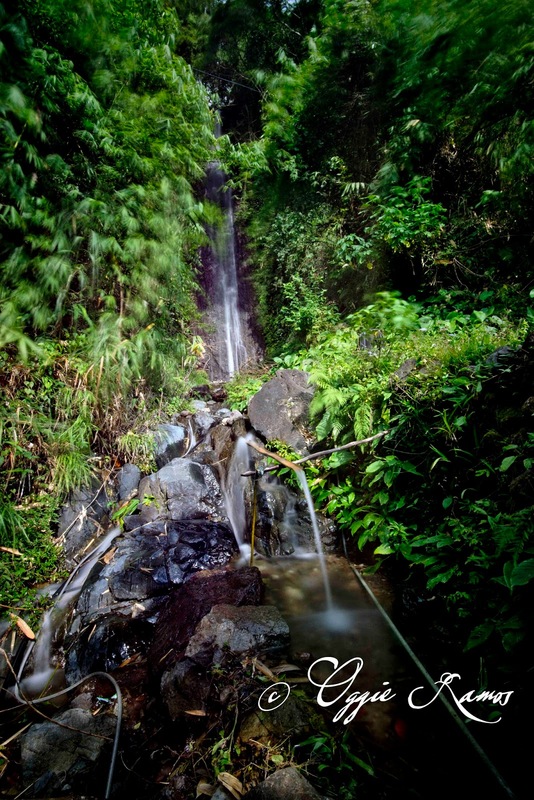 The latter is more popular though due to the number of tourists that find their way there. Caneo is not exactly a place that can be easily accessed by outsiders. Another thing is that there's no "branding" for their products as each household does its own weaving independent of the neighbors. The weaving tradition may be communal but the effort to market is up to the individual household or weaver. In my opinion, this is a pity as the quality and designs of the Caneo woven products can stand side-by-side with the ones produced in Sagada and yet these have to find a bigger following outside the weekend markets in Bontoc proper. That also means that the weavers here are not making much of a livelihood out of weaving for a big part of the year. Auntie Benita says demand peaks around mid-year and end of the year, with the other months in between being lean. She doesn't stay idle though, keeping at it. She hopes that her adorable granddaughter, Shakira, learns the same way she did from her mother -- by observing. HIKING TO CHAPYOSEN. Three village boys guide us on the trail broken only by the rocky boulders by the river where they turn back and we proceed by ourselves. About an hour and a half hike takes us from the rocky river bank to a forest trail some 500 feet above it and onto Chapyosen, a sitio of Caneo where we found a lone foreign tourist, a Canadian, staying in one of the houses. We also found a lot of the weavers at home, perhaps owing to the fact that out here, there are even less land to till and use for planting. We find two more backstrap weavers here, outnumbered by loom weavers. With the fair weather holding, we find some of the women weaving out in the open, even in-between houses. The houses here are space more far apart, the silongs (the usable space underneath the abodes) even more well-kept, neater than the ones in the main village. The locals here, like in the main village, are friendly even if the places receive few outside visitors. By mid-afternoon, we get back on the trail across the suspended bridge and hike to Tocucan, hopefully, to catch a tricycle for the Bontoc poblacion and fingers crossed, make it to the last jeepney trip back to Maligcong at 5:30pm. I was huffing and puffing a lot of the time blaming my lack of fitness again for my slow pace but the scenery can't be beat, over an hour of hiking through forest trails that at times open up to a view of the distant mountains or the river below. It would be over 5pm when we reached Tocucan and the sky unloaded its pent-up precipitation held up from three days of no rainfall. The rain would follow us back to Maligcong, soaking us as we sat on top of the jeep, eager to get back home with our stash from Caneo, sealed and protected in our backpacks.